DAZ Studio Pro BETA - version 4.6.3.29! Getting my feet wet in DS with this version, and it seems pretty impressive. I have to do things a bit differently in here than I do in Carrara, which is to be expected. Although I still love my Carrara Pro, I think it will be good for me to get to know DAZ Studio as well. At first glance, especially with the super-awesome customizable interface, things seem much easier in DAZ Studio than in Carrara. That is... until it comes to setting the render engine to save time on this, while spending more time on that, etc., and the basic working of lights and materials, which is where, in my opinion, Carrara shines in ease and efficiency. One strange thing is how long it takes DS to go through some ritual of 'optimizing images' before the first render of that scene. All renders afterwards are blazing fast, even at high settings. But even a small scene (compared to what I'm used to working with) takes a long period of time prior to that initial render. I haven't yet checked to see if it does that again for a scene that I've saved to the library. I hope not. Those very few things mentioned, I must say that DAZ Studio, in my opinion, is an amazing 3d rendering studio. I haven't even gotten into any of the Uber stuff or Age of Armour's cool sub-surface stuff (gotta Love AoA!) and I'm already enjoying myself. Prior to using DS Pro as a render studio, I've been using it as a Content Creation app. And not much of that either... yet. But seeing what I've seen, it will start to happen a lot more. The CCTs in DS are really well done, and appear to be getting better and more robust. Amazing how little work is left for me to do by the time these tools have finished their fine work... I love it! Truly, I think that it was the "Optimizing Images" that threw me for loops in the past, and got me to shy away from this lovely software, unknowing that it doesn't do that after it's done it once. So I've never really given it much of a chance for rendering. Now that I've spent a day playing with it, building a product inside it, I am really taking a liking to it. Bravo, DAZ 3D development team, Bravo! Optimising Images is something 3Delight needs - it is taking the original textures and producing mip-mapped versions as .tdl files in the Temp folder. Unfortunately they are cleared on closing DS or doing File>New. Hey Dart, everything Richard said and keep in mind that 3Delight is originally meant and designed for motion picture work and animation. So it needs the conversion, but if you are doing animation, you won't mind at all! There are ways of tweaking settings for speed improvements. Once you get used to it, it will be easier to find the time savings. Just think of all the folks who use DAZ Studio but can't seem to understand Carrara. ;) Remember that the basics apply. Cranking settings up in DAZ Studio will make it crawl like cranking them up in Carrara makes it crawl. Experiment and you will be happy. Is there a tut on how to do polygon selection now that it is part weight map tools? I tried it on a cube and after much 'pushing buttons, see what happens' couldn't make any selection after the first two. 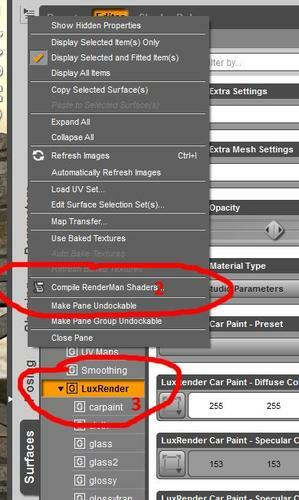 Is the renderer bridge Luxus not supported in this beta? In the "normal" version I get pic1: No 1. In the beta Version I miss the luxus menu (pic_beta: No 2). But luxus works (No 3). Many thanks. Now it works. So far, the menu has been added automatically. I manually copied the Luxus plugin to the public build. 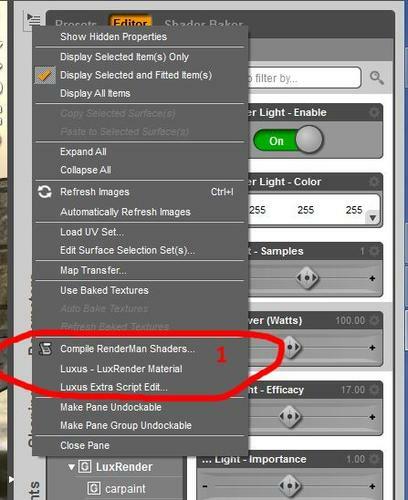 The Luxus render option shows in the Render tab; the Luxus materials option shows in the pulldown menu for the Surfaces tab; but the Luxus light entry does not show in the pulldown of the Parameters tab (this menu seems to be substantially restructured in this release). Am I overlooking something? Did I read correctly that we can now render wireframes in DS?? If so, is it as simple as turning on the wireframe view and rendering? Turn on wireframe drawing and switch the Render Engine to "Preview Renderer"
WOW.. that works great. Be nice if eventually you could move that up to a normal render so that folks could get various effects from their lighting. This means it's not using unix domain sockets, and is implicitly accepting all connections over localhost (regardless of which user its from). For a local desktop installation like this, bound only to localhost, the "all users" thing probably isn't a major concern. From a performance perspective, have the coders tested using unix domain sockets instead of TCP? Unix domain sockets (on OSX) should be a bunch quicker, and probably only needs the database connection string changed. This means it’s not using unix domain sockets, and is implicitly accepting all connections over localhost (regardless of which user its from). For a local desktop installation like this, bound only to localhost, the “all users” thing probably isn’t a major concern. The hba conf file defines the source addresse that PG will accept. So you can define IP addresses (V4/V6), users and databases as you need it. Unix domain sockets doesn't work over the network, they are just local connections (IPC) similar to pipes. If the line is in the hba file PG will accepted those (local) connections, otherwise not. Kidding... just the few answers I've been given in this forum so far have got me looking in the right places for the right things... jammin' now! Unix domain sockets doesn't work over the network, they are just local connections (IPC) similar to pipes. DAZ installs the CMS locally, so it makes more sense to use Unix domain sockets (higher bandwidth, less latency) than TCP sockets. In the future, if the CMS is adjusted to work for not-just-local-user scenarios (eg work groups using shared DB), then using TCP sockets there would make sense. True, but it will not work on windows machines. And I really doubt that the difference will be noticeable. (If the performance is that bad I guess there are other things to tune). I really doubt that the difference will be noticeable. Some of the people on this forum mention they have rather large data sets. For them, it may make a difference. Or it may not. With regular PG databases on a local system, it's one of the useful tweaks that can be done. So why not with the DAZ CMS? Without testing though, we're only guessing. Send a PM to Richard Haseltine with the name you want. Finally!! This is a workflow I can relate to. This should do it for me. The indiscriminate spraying of content all over the place was getting annoying and a deterrent to buying more stuff. Any more info on these? By objects, do you mean figures as well, with conformed stuff? So no more saving a figure and merging it as a scene again and again? Do you have an example of what you mean by "into that figure"? Would it become part of that figure, such that the collision modifier would then consider both as part of one figure? For example, a figure with pants and a long shirt. Merge pants to figure, and then collision modifier the long shirt so that it collides with both figure and pants? Oh, thanks for pointing that out. That's a real good one. My question to the developers though is that once it's in the Smart Content pane will it stay there? Often times in the Content Manager I've added things to the Smart Content pane through the right click options and upon rebooting the computer it was all undone! Nada was showing of what I added.... It's been a while so don't ask me to tell you the steps! LOL Inconsistency with adding things to the Database is one of the major reasons we are switching databases. I am going to leave 12 to someone that understands how to explain it better. 11. Yes that does include figures. To put an additional copy in your scene. 11) Can duplicate single objects ( a figure is considered a single object even though it is made up of multiple nodes) or a hierarchy of objects. If using the hierarchy duplicate and conformers/followers are in the hierarchy of the source figure they will be duplicated and conformed to the duplicated figure. 12) Is an action that makes multiple figures one figure. Its mostly designed for content creation purposes. Once done it is permanent and not undo-able (if you merge a tail into the figure the figure now always has a tail). The figure created from it need to be saved as a completely new asset or it will have issues. It is not recommend to do this for collision purposes. It is meant as a compliment to the "Delete Hidden Facets" action that Studio already has. So if one were to build something with Casuals new script to make frames or what not or use a set of primitives from within DS and then use this feature one would then have a single object that can be uv'd and used ..........My question then for this then: Do the sections still retain their separate poly group information? Really huge time saver. Another winner! Really looking forward to the general release. I finally managed to install the pg cms on a machine (not the one I started with, there I still get the same error). It seems that 17237 is the port used for the DB, correct? What is the user name and password that is used to login to the database. Is it possible to change the user name and password, and if yes, how? Thanks again for any information. 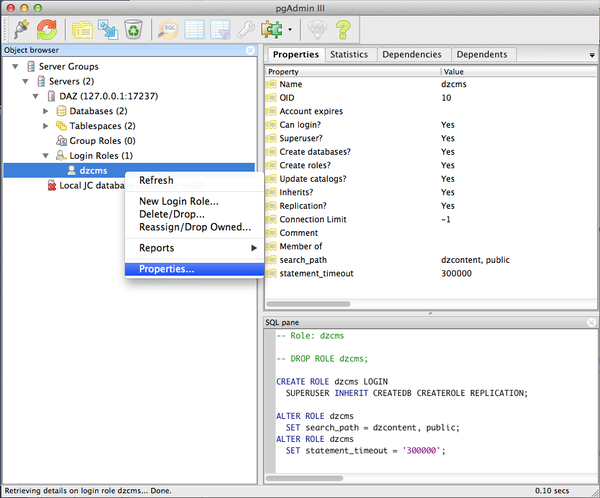 That should query the available databases using the PostgreSQL "psql" command (normally an interactive terminal). Its using the "dzcms" user (as shown in pg_hba.conf), connecting on port 17237 over localhost, which (in theory) shouldn't require a password (as per pg_hba.conf). Note, the font for "code" blocks on this forum is a bit hard to read (for me anyway). 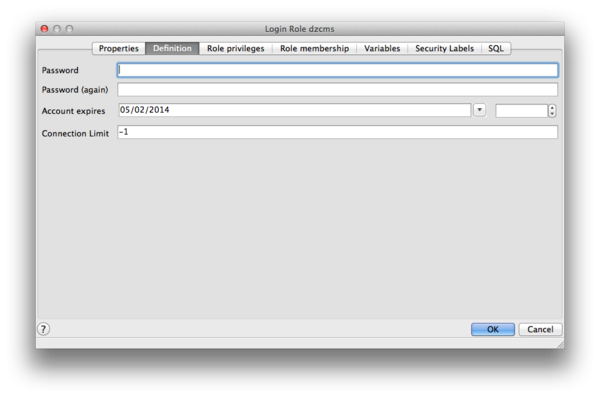 The end of that psql command is "-l", which is a lowercase letter L, not a number one. The "template0" and "template1" database are default PostgreSQL ones, used for its internal purposes. (eg don't modify them). The "Content" database is likely to be what you're after. The commands for doing this are the same on Windows, you just need to adjust the paths to be Windows specific. You can also use the pgAdmin utility to connect as well, using "127.0.0.1" as the hostname, "dzcms" as the username, and "17237" as the port name. Just tried it, it works. You can change a PostgreSQL user password fairly easily using pgAdmin or from the command line, as long as you can already connect to the database. The screenshots attached show where to do it in pgAdmin.